NASA scientists are using a supercomputer to aid in the hunt for moons outside of the solar system that might play host to alien life. The search for alien life doesn't end within the boundaries of our solar system.Scientists are now search for moons orbiting alien planets that might play host to extraterrestrial life. They then compare the results with actual data taken with NASA's Kepler telescope, which monitors the brightness of stars in an effort to find exoplanets that could harbor life. If one of the simulated combinations matches the Kepler data, that area warrants further exploration. So far, the team has surveyed 56 of about 400 Kepler planet candidates that could have an exomoon. Surveying the remaining 340 would require 50,000 processing hours per object and nearly a decade on a smaller computer. The Pleiades Supercomputer, which performs over 3 quadrillion calculations per second, knocks that number down to 30,000 processing hours per object and should complete the project in two years. "For each planet where we don't discover an exomoon, we are able to say how massive a moon is excluded by the current data, telling us about our sensitivity," Kipping said in a statement. HEK scientists compare the exomoons they're searching for to the moon Pandora in Avatar. But unlike a science-fiction film that depicts complicated and evolved societies, astronomers say signs of life on an exomoon could be as simple as "some form of primitive biology." And life on one moon could mean life on many more. "If such habitable moons are possible, then there could even be more habitable moons than habitable planets," HEK scientists said on their website. 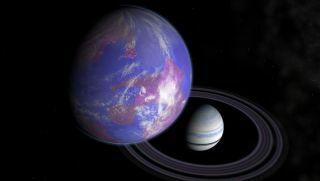 Although astronomers spotted what might be an exomoon in April 2014, scientists have not confirmed their existence.